Audio CDs confuse many people and Windows - trying to be helpful, of course - doesn't help. The fact is that an audio CD is a very different beast from a data CD. Windows may try to make an audio CD "look like" a data CD by listing its contents as one .cda file per track, but in reality, it's just fooling you. Those "files" aren't really there. Many people think that if they could just convert their .mp3 or other audio files into that .cda file format, they can just write them to the disc and they'd have an audio CD disc that would play in any player. Continue reading: How do I burn an audio CD? Do you need to keep some ex-friends out of your email or to find a list of recipients? Do you have crash reports and device errors? Wonder if it is safe to keep Outlook Express any longer? All that and more in this Answercast from Ask Leo! Instead of your browser, what I suggest that you use is a program like LastPass to remember your passwords for you. Continue reading: How do I get IE8 to remember my email password? Exactly how you go about displaying recipients depends dramatically on what specific email service you happen to be using. Continue reading: How do I display the full list of recipients in my sent email? The error message is literally telling you exactly what's wrong: there was an input/output error on the device. Continue reading: Why do I get an I/O device error when I try to create a system image? Continue reading: Does having my video card on the motherboard mean I can never upgrade? I found what appears to be a crash report for MsMpEngine. What should I do? Continue reading: I found what appears to be a crash report for MsMpEngine. What should I do? If friends (especially ex-friends) are looking at your email and they have access to your account, I would seriously consider that you treat this has a hacked email account. Continue reading: My ex-friends tell me they can read my email, that it'll go to them. Is that possible? What do I do? To help diagnose the problem, try a two-step approach. Separate downloading the file from opening the file with Adobe Reader and watch for error messages. Continue reading: Why can't I download PDFs in IE9, but I can in Chrome? I personally consider Outlook Express a ticking time bomb. As you accumulate more and more email, the risk of encountering a problem goes up - but there is one way to protect yourself. Continue reading: Is it safe to keep Outlook Express? There may not be a way to turn that off. If you're not using Maxthon as your primary browser, I'm not sure there's a reason to have it on there at all. Continue reading: Why is the Maxthon browser always setting itself as the default browser, and how do I stop it? In situations like this, my bet is almost always on the anti-malware tools you have installed... They're attempting to integrate just a little too tightly into the email process. Continue reading: Why is my email being immediately deleted as it arrives in Thunderbird? 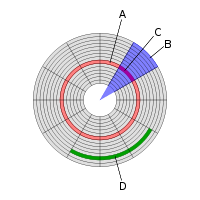 A sector is a fixed-size "chunk" of information as stored on magnetic or other media such as hard disks, optical discs and even flash-based memory. platters - the entire surface of one side of one or more of the metal disks in the drive. Each disk is coated with magnetic material used to hold individual bits of digital information. (Entire image to right represents one platter). Sectors are accessed as single units at the hardware level. This means that when reading the entire sector is read regardless of how much of its contents are required. Similarly when writing it's the entire sector that's written, regardless of how much information in it is to be changed. It's election season in the U.S., and that means that there's a lot of information and misinformation flying around on the internet via email and social media sites. Regardless of your leanings and affiliations if you must share please take a moment and make sure what you're about to forward or post is at least accurate. There's a lot of garbage out there. Not only does spreading blatantly wrong information hurt everyone, it makes you look bad - often really, really bad. It's a sad reality, but those items that rise our ire, that tug at our heartstrings or simply sound flat out horrifying are often completely false. And if not totally bogus, they're often so slanted and obfuscated that they might as well be. There are plenty of authoritative sites to double check that what you've just received is, or is not bogus. Snopes is my favorite for urban legends, and often covers political items as well, but there are many, many others. Help make the internet a better place: think twice, and check twice, before forwarding or sharing.